I've added new datafiles on the Depersussin and Dewoitine D9 and D19 to the Belgian Wings website. Brussels Airlines verstevigt haar marktpositie gevoelig en start het zomerseizoen met tal van nieuwe bestemmingen, bijkomende vliegtuigen en investeert in service innovaties. Tijdens een persconferentie in Brussel onthulde CEO Bernard Gustin vandaag de nieuwe commerciële strategie van Brussels Airlines. De luchtvaartmaatschappij werkte de voorbije maanden hard aan een verbetering van haar productiviteit en van de kostenstructuur, die met 10 procent daalde. Tegelijkertijd werd flink geïnvesteerd in service en comfort voor de passagiers. De inspanningen leidden tot een gevoelige passagiersgroei, een hogere passagierstevredenheid en een rendabiliteitsverbetering. Dit heeft de maatschappij toegelaten om te investeren in de uitbreiding van haar netwerk: deze lente en zomer zullen er talrijke nieuwe routes op het programma van Brussels Airlines staan. In de loop van de volgende maanden wordt de bestaande Airbus vloot daarom uitgebreid met twee bijkomende Airbus A319 toestellen. In totaal werden vandaag negen nieuwe zomerbestemmingen bekendgemaakt en twee nieuwe bestemmingen die Brussels Airlines het hele jaar door zal bedienen. Het gaat om de grootste netwerkuitbreiding in de geschiedenis van de maatschappij. Met Ajaccio, Athene, Bari, Bastia, Cagliari, Figari, Malta, Montpellier en Sevilla worden populaire zomerbestemmingen aan het netwerk toegevoegd. De nieuwe lijnvluchten naar Krakau en Warschau illustreren een sterke investering in de Poolse markt. Daarnaast worden de vluchtfrequenties naar talrijke bestaande bestemmingen (Firenze, Palermo, Marseille, Catania en Madrid) gevoelig verhoogd, wat resulteert in een totaal van 400.000 extra aangeboden zetels in 2014. Naast een netwerkuitbreiding heeft Brussels Airlines nog meer projecten op het programma staan. Later dit jaar wordt een vernieuwde brusselsairlines.com gelanceerd die passagiers nog meer mogelijkheden en selfservice opties zal bieden. De maatschappij zal ook nieuwe productformules introduceren, om beter te beantwoorden aan de specifieke noden van de verschillende types passagiers. Er wordt ook gewerkt aan een nieuw getrouwheidsprogramma, voor het Europese netwerk van Brussels Airlines. Het programma zal naast het huidige Miles & More bestaan. Tenslotte opent de maatschappij eind 2014 haar vernieuwde luchthavenlounges op Brussels Airport. 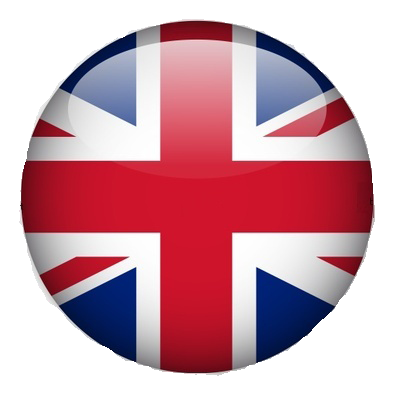 We have 2 places if you are interestred to discover what is aircraft restoration. « Het ACM-reconstructieteam heeft het genoegen u zijn Februari 2014 "Toestand" op te sturen; veel leesgenot en wij houden ons uiteraard aanbevolen voor commentaar". Video: "Piper L4 Grasshopper (Cub)." Lors de la Seconde Guerre mondiale, alors que le territoire français était occupé par l'ennemi, nombre d'aviateurs alliés tombés en Picardie ont été secourus par la population et ont ainsi échappé à l'arrestation. - de rappeler la mémoire de ces jeunes aviateurs qui ont péri ou qui ont été recueillis sur notre sol et d'en assurer le souvenir auprès des jeunes générations. - de rappeler le souvenir et collecter les témoignages des personnes de notre région qui n'hésitèrent pas, malgré l'Occupation, à venir en aide à ces aviateurs en les hébergeant et en les convoyant sur les voies de la Liberté. Bertrand Brown a publié:" Au sommaire de ce premier numéro 2014 de l'émission: Retour sur la saga des moteur Renault d'avant guerre Présentation du dernier Caudron "Simoun" C635M en restauration Les projets de restaurations Nord 1000 en France Voler sur P-51D Mustang c'est p"
Et un grand merci à Marc Tauran pour le petit "coup de pouce"/"coup de pub" concernant la Newsletter du French Wing. 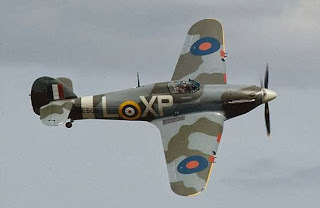 A very nice website about the Hawker tempest. Making history: Eric Brown (pictured at home in Copthorne, Sussex) has flown more aircraft than anyone else in history, and was the first man to fly a jet on and off an aircraft carrier. Eric Brown must rank as the most extraordinary airman alive. Indeed, open his memoirs at any page and you are left asking a single question: how on earth did this modest Scotsman live to tell the tale? 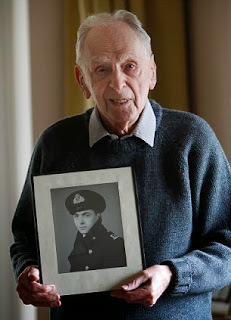 But Captain Eric 'Winkle' Brown RN is very much alive and in sparkling form as he pours me a glass of sherry at his West Sussex home and reflects on an astonishing life. This is the man who has flown more aircraft than anyone else in history. He was the first man to fly a jet on and off an aircraft carrier. He has set aviation records that will almost certainly never be broken and is revered as one of the greatest test pilots of all time. But even if you take out the aerobatics, his story is remarkable. 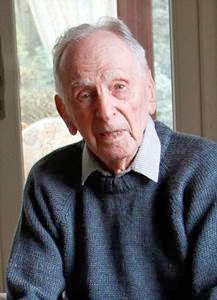 Here is a man who narrowly cheated death in the wreckage of a torpedoed ship, helped to liberate Belsen and took 2,000 enemy prisoners armed only with a pistol. 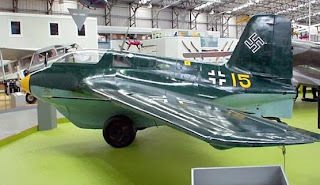 In the immediate aftermath of the war, Eric had to interrogate a bewildering cross-section of leading Nazis, including Hermann Goering, as well as plane manufacturer Enrst Heinkel and designer Willie Messerchmitt. In fact, young Brown would soon be back once more to receive the King's Commendation for Brave Conduct. Years later, he would end up as an aide-de-camp to the Queen, who would add a CBE to his collection in 1970. Pin-sharp at 94, Eric is in constant demand from historians and documentary makers, while his autobiography, Wings On My Sleeve, is a must-read for any self-respecting aviator. Now he is about to tell all as one of the star speakers at next month's Daily Mail-sponsored Chalke Valley History Festival. What's more, his appearance on the last weekend in June will coincide with the Chalke Valley History Festival Airshow — one of this summer's most spectacular, featuring replica dogfights from both World Wars. It will certainly bring back memories for Eric, whose flying career was shaped by these conflicts. Eric's father had served in the Royal Flying Corps during the Great War and, along with all former RFC pilots, received an invitation from the newly formed German Luftwaffe to visit the 1936 Olympics. A promising scholar at Edinburgh's Royal High School, Eric had recently lost his mother, so his father decided to take the boy to Germany to see the Games. Among those hosting the RFC delegation was the charismatic Great War ace Ernst Udet, who had become a famous stunt pilot. He took up Eric for a spin — 'Terrifying stuff' — and the teenager was hooked. Eric went on to Edinburgh University, where he studied German and joined the university's air squadron. During a student trip to Germany, he wrote to Udet, by then a senior Luftwaffe general, who invited Eric into his social circle. 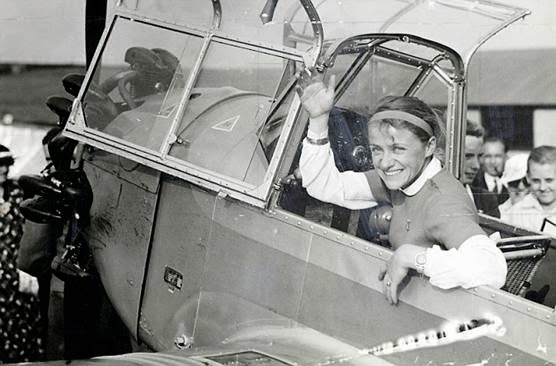 The wide-eyed student was introduced to some of the leading lights of the Luftwaffe — including their formidable test pilot and world gliding champion Hanna Reitsch — having no inkling that, within a couple of years, they would be his sworn enemy. 'Udet was like a schoolboy who regarded the whole world as a friend,' says Eric. 'He had these riotous evenings at his flat in Berlin. One of his party tricks was a shooting game where you had to fire a pistol at a target behind you, using a mirror. It made a mess of the wall, but he was very good at it. In 1939, having recently arrived in Germany on a teaching exchange, Eric received a knock on the door one morning. 'Our countries are at war,' said an SS officer, before taking away Eric for interrogation. Eric was transferred to special duties as a test pilot. Among his tasks was working out ways of flying Spitfires, Hurricanes and Mosquitoes on and off ships, vastly improving the clout of the Fleet Air Arm. Pictured is a Hurricane IIB. 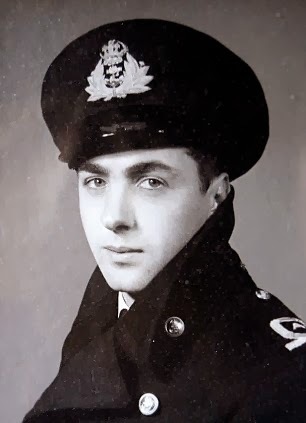 So Eric transferred to the Fleet Air Arm — where he was nicknamed 'Winkle' — and retrained as a naval pilot. Before long he was on HMS Audacity, an aircraft carrier escorting vital convoys between Britain and Gibraltar. His bravery in his Martlet fighter soon earned him the Distinguished Service Cross. Then, in December 1941, his ship was torpedoed and sank 450 miles off Cape Finisterre. He was one of the few survivors after floating in the water for several hours. 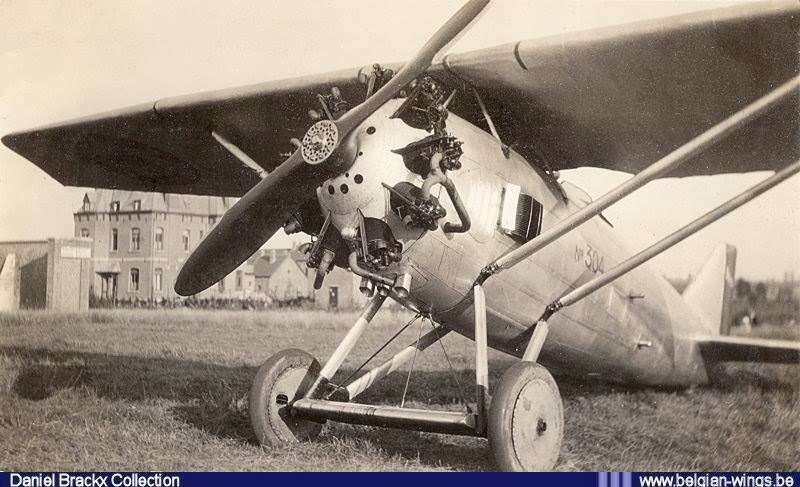 Back home, his exceptional flying skills had been spotted and he was transferred to special duties as a test pilot. Among his tasks was working out ways of flying Spitfires, Hurricanes and Mosquitoes on and off ships, vastly improving the clout of the Fleet Air Arm. By 1944, Eric had moved to the top secret Aerodynamics Flight based at Farnborough. 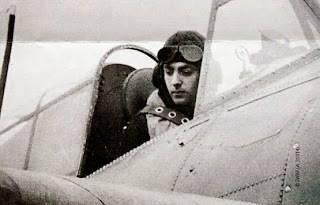 And when he wasn't testing the boffins' latest theories, he was also charged with training a gung-ho band of Canadian Spitfire pilots with whom he saw regular action over France. Winston Churchill needed a solution to the Nazis' unmanned V1 rocket bombs, which were terrifying the civilian population. One of the first had reduced Eric's home, near Aldershot, to rubble. 'My wife was injured, our cleaning lady lost an eye and the dogs disappeared, so my interest was personal,' he says. Eric helped develop a booster system that could get a fighter alongside a V1 for a short spurt and tip it off-course without colliding. It led to Eric's first — and last — bail-out. 'One day, the engine caught fire and my feet were starting to fry, so it was time to go over the side,' he says, matter-of-factly. As the Allies progressed through Italy and France, Eric became commanding officer of a very exotic unit — Farnborough's Enemy Aircraft Flight. His task was to capture and evaluate as much Nazi hardware as he could find. One of the most unappealing was a Messerschmitt 163 — a rocket plane that ran on liquid explosive. In 1945, landing at a newly captured airstrip in Germany, he met Allied troops investigating rumours of a concentration camp at Belsen. Realising that Eric had better German than his interpreter, the brigadier in charge asked him along to assist with translation. 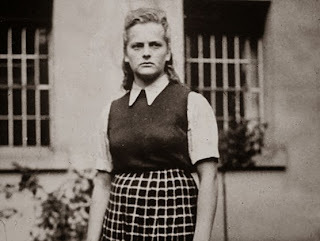 Eric has never forgotten the sights he encountered nor the remorselessness of the female commandant he interrogated, Irma Grese. 'She was the worst human being I ever encountered,' he says. She was hanged a few days later. Soon afterwards, Eric flew in to another air base in Denmark, only to discover the Allies had yet to capture it. 'I was in this little Avro Anson and there were still 2,000 enemy troops there,' he says. Given his excellent knowledge of German and aeroplanes, Eric interrogated all the enemy top brass. He did not warm to Willie Messerschmitt. 'We had a bit of a to-do,' says Eric, with mischievous understatement. Dr Ernst Heinkel was a 'funny little man'. 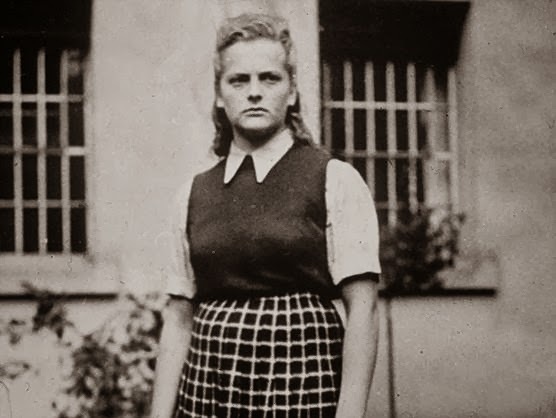 Eric's erstwhile mentor, Udet, had committed suicide in 1941, but one day Winkle found himself in an interview room with Hanna Reitsch, still an unrepentant Hitler worshipper. He even interviewed Hermann Goering. 'His uniform was falling off him, but he perked up when I told him he was going to be interviewed by a pilot. He answered all my questions. After the war, Eric worked with Sir Frank Whittle, the inventor of the jet engine, clocking up numerous life-threatening 'firsts' in the field of jet aviation. Among his unappetising tasks was discovering why certain aircraft would crash at certain speeds, and why planes had a habit of disappearing in storms. It is also highly unlikely that anyone will surpass Eric's world record for flying 487 different types of aeroplane. A proud grandfather and great-grandfather, he is typical of his generation in insisting that he was 'only doing the job'. But Eric Brown did not merely witness history: he made it, too. And it is a hell of a story. -- "Vive in libertate aut morere!" Video: Mosquito "The Plane that saved Britain HD"
Vintage Wings of Canada : What's That Fighter? Video: "Patrouille de France 1961 Mystere IV"